The Roving Ronin Report: Mayan Apocalypse Comes to Japan!?!? Mayan Apocalypse Comes to Japan!?!? Officially the end of the world by the Mayan Calendar will not come until late morning December 21st in the Western Hemisphere according to Mayan time not New Zealand time. Already some apocalyptic signs have appeared in Japan as the day there turned December 21st. It may be nothing or it may be something. 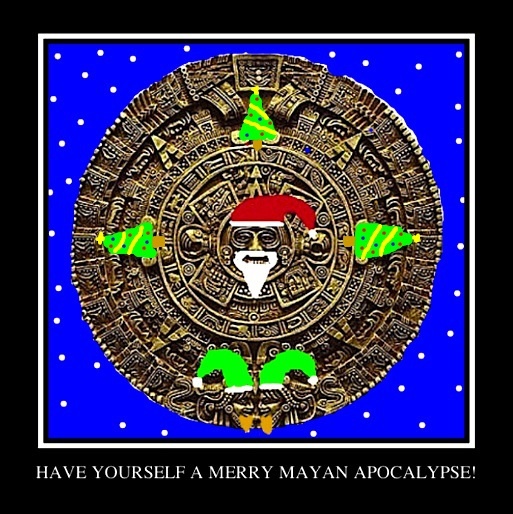 Either way I just wanted wish everyone a Merry Mayan Apocalypse as the sun devours the earth causing your blood to boil till it bursts from your charred skinned while your eyes melt like gooey marshmellows in your blackened skull! I also updated the Mayan/Aztec calendar with some cheerful christmas trees to make the coming apocalypse a little more festive.